Joel Kass hides his secrets. 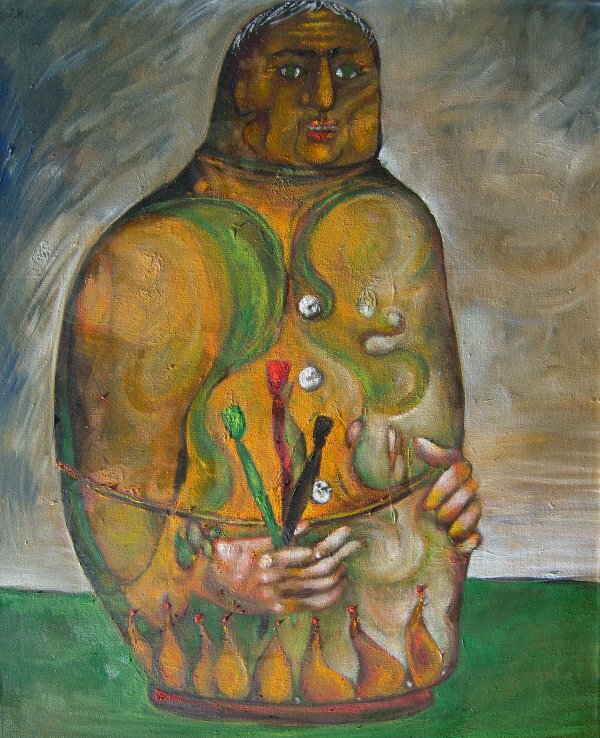 This rare painting portrays the painter as a matryoshka doll. Most of my art ships directly from my own studio, right here in Israel. If you live in Israel and would rather come and pick it up, please send me a message through our contact form once you have completed the purchase. I offer free shipping on all my paintings, regardless of your country of origin. Delivery time may vary, depending where we will be shipping your purchased artworks, but we will make all efforts to be as fast as we can. All painting will be shipped rolled up and you will need to have it framed. Please be careful choosing a reputable framing shop so they do not damage your artwork. My paintings are mostly European standard size, but not always. Please be aware that measurements of my paintings are estimates and may vary slightly from what may be stated by a margin of few centimeters. Obviously, the colors may vary as well as they may not be reproduced by all monitors exactly as they appear in reality. All purchases are final and no refunds will be offered. Thanks again for choosing to purchase my artwork. It means a lot to me.